Chase Rice (born September 19, 1985) is an American country music singer, songwriter, and reality television personality. Rice is also a former college football linebacker for the University of North Carolina and former NASCAR pit crew member for Hendrick Motorsports. He co-wrote the single "Cruise" performed by Florida Georgia Line. He released the EP Ready Set Roll, featuring the single "Ready Set Roll", on October 15, 2013. The full-length album Ignite the Night was released on August 19, 2014, and includes "Ready Set Roll". On August 27, 2014, Ignite The Night debuted at #1 on Billboard Top Country Albums. He first came to prominence in 2010, when he was a contestant on Survivor: Nicaragua, where he was the runner-up to Jud "Fabio" Birza. Born in Florida, Rice was raised on a farm in Asheville, North Carolina. He attended AC Reynolds High School and the University of North Carolina at Chapel Hill, where he was a linebacker on the football team, but did not pursue an NFL career due to injury. After graduating from UNC, Rice was selected to join the Hendrick Motorsports pit crew as the rear tire carrier for Ryan Newman’s Nationwide Series car. He also worked on Jimmie Johnson's Sprint Cup Series car and won two championships with the Lowe's team. Rice was selected as a cast member of the reality television show Survivor: Nicaragua. He said that he was able to get his application into CBS through a college friend who had a connection with the network. Rice was originally on the La Flor tribe, consisting of younger contestants. During his time on the tribe, he was quickly attracted to fellow contestant Brenda Lowe, who became aware of his attraction and used it to her advantage, recruiting him and several others into an alliance. However, after La Flor won three of the first four tribal immunity challenges, the tribes were blended and Rice ended up on the new version of the original "older contestants" tribe, Espada, while Lowe remained on the new version of the La Flor tribe. Rice and Lowe both ultimately made it to the merged group, Libertad, where their alliance successfully caused the eliminations of Alina Wilson and Marty Piombo, before turning on Lowe and eliminating her as a threat. Following Lowe's elimination, Rice continued with the alliance under new leader Matthew "Sash" Lenahan. After two contestants (NaOnka Mixon and "Purple Kelly" Shinn) quit, the alliance continued eliminating targets Ben "Benry" Henry, Jane Bright, Dan Lembo, and Holly Hoffman, although Bright and Hoffman were members of the alliance. The alliance tried to eliminate Jud "Fabio" Birza as a threat against the jury, but Birza managed to evade them by winning the last three consecutive immunities. Rice performed exceptionally well in the post-merge challenges, being on the winning team in two of the three team-oriented rewards, and winning the last two individual rewards. Eventually, Rice made it to the final three with Lenahan and Birza, where he had a chance to win the $1 million as "Sole Survivor". In pleading his case to the jury, Rice claimed that he was being open about how he played the game, but was criticized both for his rash decisions and occasional indecisiveness, as well as being perceived as a follower under both Lowe and Lenahan. Although both Rice and Lenahan tried to accuse Birza of not knowing what was going on in the competition, the jury still ultimately chose Birza who received five of the nine votes; Rice received the votes of Hoffman, Bright, Lowe, and Wilson. On the nationally televised reunion show, Rice played his single "Buzz Back". Although he received national media attention on the show, he says that reality show stardom did not help propel his country music career; instead, he cited it as an important life event that was more valuable than money and that put his life in perspective. In the official issue of CBS Watch magazine, commemorating the 15th anniversary of Survivor in 2015, Rice was voted by viewers as the 10th "steamiest" male contestant in Survivor history. Chase Rice began playing guitar in college. He cites his father as the inspiration for his career, recalling his father saying "boy anyone can play guitar, but no one is gonna really listen to you until you start singing." He models his albums after his live show and is building his career through the performance aspect. His first studio album, Friday Nights & Sunday Mornings, was released on April 22, 2010. This 13-track album includes the first song he ever wrote/recorded, “Larger Than Life”, which is about the passing of his father. In March 2011, he released Country as Me, a 6-track EP featuring his single "Buzz Back". He has received air play as a "Highway Find" on satellite radio channel The Highway (Sirius XM). In April 2012, his Dirt Road Communion debuted as #48 on the Billboard Country Albums chart and was the #6 download on iTunes for the week. In October 2013, he released Ready Set Roll, a 6-song EP including the title track. Ready Set Roll peaked at #1 on the iTunes Country album chart. The physical version of the album was released in November 2013 and included the bonus song "Jack Daniel's and Jesus". On January 29, 2014, the official "Ready Set Roll" music video premiered exclusively on CMT. The next day, the video debuted on VEVO. He partnered with Columbia Records for distribution of "Ready Set Roll" in March 2014. On June 30, 2014, Rice released the album cover, release date, and album sequence for Ignite the Night. The full-length album was released on August 19, 2014, and included the Platinum-certified single, "Ready Set Roll". In February 2016, Rice released "Whisper", the lead single from his upcoming album. The song failed to gain any traction on radio, peaking at #56 on the week of April 23, 2016, after just 3 weeks of being on the Country Airplay chart. It is currently Rice's lowest peaking single to date, only behind How She Rolls which peaked at #55 in 2013. "Everybody We Know Does" was sent to country radio on June 24, 2016. Rice left Columbia in 2017 and signed to Broken Bow Records the same year. The lead single from Rice’s first album with BBR, “Three Chords & The Truth” was sent to country radio. Lambs & Lions is Rice’s first album on Broken Bow Records/BMG and is also the first album released by BBR since the BMG takeover. Lambs & Lions came out on November 17, 2017. ^ Casey, Jim (July 1, 2016). "Chase Rice Might talk New Single, Wikipedia Errors and Showing More "Depth" With an Upcoming Album". Nash Country Daily. Retrieved July 2, 2016. ^ "Chase Rice". Billboard. August 28, 2014. Retrieved October 21, 2014. ^ a b "Chase Rice Biography". Artists. Great American Country. Archived from the original on January 24, 2013. ^ a b c Dauphin, Chuck (May 16, 2012). 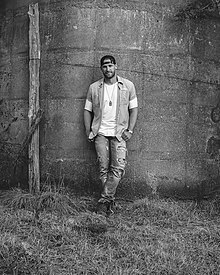 "Spotlight: Ex-'Survivor' Star Chase Rice Debuts Big With 'Dirt Road Communion'". Billboard. ^ Fadorski, Kelli Skye (February 28, 2017). "From a NASCAR pit crew member to 'Survivor' star, Chase Rice still prefers country music". Orange County Register. Digital First Media. Retrieved February 28, 2017. ^ a b "Chase Rice". Hill Country BBQ, Washington, D.C. Retrieved March 5, 2016. ^ "Exclusive: 'Survivor: Nicaragua' runner-up Chase Rice talks". Reality TV World. December 22, 2012. ^ Wilkening, Matthew. "'Survivor' Finalist Chase Rice Debuts Country Song on Season Finale". Taste of Country. ^ "Indie artist Chase Rice Signs with CAA". Nashville Country Club. July 19, 2012. ^ "Chase Rice 'Cruise's with Florida Georgia Line to Platinum Success and a #1 Single". Got Country Online. Retrieved December 28, 2012. ^ "Official Ready Set Roll Music Video Premieres on CMT". Archived from the original on February 21, 2014. Retrieved February 4, 2016. ^ "Columbia Nashville Inks Strategic Partnership With Chase Rice". MusicRow - Nashville's Music Industry Publication - News, Songs From Music City. Retrieved October 21, 2014. ^ "Chase Rice's New Lead Single "Whisper" Takes a Flop. Big Time". Saving Country Music. April 19, 2016. Retrieved July 31, 2016. ^ "Chase Rice - Chart history". Billboard. Retrieved July 31, 2016. ^ Lauren Laffer (June 24, 2016). "Chase Rice Releases New Single, 'Everybody We Know Does' Sounds Like Nashville". Soundslikenashville.com. Retrieved July 31, 2016. ^ "Chase Rice Signs With Broken Bow, Ready to Release New Music". The Boot. Retrieved December 10, 2017. ^ "Chase Rice Is Gonna Wanna See You This Fall on Tour". Tasteofcountry.com. Retrieved March 5, 2016. ^ "CHASE LAUNCHING BACK TO COLLEGE TOUR IN APRIL 2016". Chaserice.com. Retrieved March 16, 2016. ^ "Chase Rice Books 2016 Everybody We Know Does Tour". tasteofcountry.com. Taste of Country. Retrieved January 4, 2017. ^ "CHASE RICE'S UPCOMING "PUB SHOWS"". ebmediapr.com/. EB Media. Retrieved January 20, 2017. This page was last edited on 19 April 2019, at 00:39 (UTC).